Distributor of Byan System Gate Operator - Venture Mfg. Co. Since 1971, Venture Mfg. Co. has become a Leader in the linear actuator manufacturing industry. 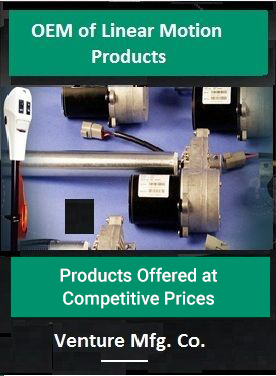 We hold a stellar reputation for providing cutting-edge actuators and industrial products at competitive prices. Now, our Venture Mfg. team is expanding its boundaries, and is adding distribution to our list of services. We are proud to say that Venture Mfg. Co. has been chosen as the authorized distributor for Byan Systems Inc. products. Among the company’s varied product list, Venture Mfg. Inc. will be distributing one important and popular product – the hydraulic swing gate operator. Byan Systems Swing Gate Operators Products Distribute by Venture Mfg. Co.
Byan Systems Inc.’s products are perfect solutions for electronic gate and access control requirements. As the authorized distributor of Byan Systems Inc., Venture Mfg. Co. provides customers a variety of solution-driven products for commercial and industrial applications. One of their leading products is the industrial microprocessor and prewire enclosures. These specially designed control units support the motors, which are used to electronically open and close gates. Byan Systems Inc. hydraulic operators can be utilized in various installations, including private residential applications and heavy duty continuous commercial applications. All Byan Products are ETL listed, and comply with the latest UL325 requirements.